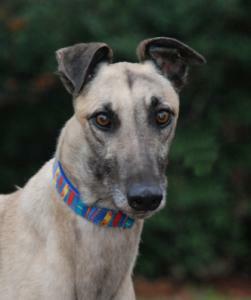 Deacon is a young, unusually light fawn male with lots of black on his face and cute little floppy dark ears. Deacon is a medium sized guy that raced at 71lbs. He is playful and LOVES stuffed animals and balls with squeakers! He is very friendly and walks like a dream on leash without pulling. He seems eager to please and is very bonded to people and likes to stand right beside you with his head in your lap. If you are cooking in the kitchen or watching TV he will be laying at your feet. He barked a little in his crate at first but did correct easily so was able to be fostered in a townhouse and should be fine living in a townhome or an apartment. He is good with children and loves everyone he meets. He has gotten along well with dogs of all sizes in his foster homes including very small dogs. He has met some cats in cages at Petco and was politely curious but not overly excited. He has not been around free roaming cats yet but it looks like he may be able to live with them. We would be glad to introduce him to your cats carefully to make sure before he is adopted. Seems like he is going to be a sweet, happy, devoted addition for some lucky family.